Earlier this week, when commenting on the latest CBO budget forecast, which now expects the US deficit will soar over 40% in 2019, and surpass $1 trillion by 2020 (in reality it may surpass $1TN by September: yesterday we showed that the US deficit was $600 billion in the first 6 months of the year, run-rating $100BN/month), we pointed out something amusing: "the CBO is now estimating that there will be no recession within the next ten years - making this the longest economic cycle without contraction in US history, lasting no less than 234 months from June 30 2009 through Dec 31, 2028." It now appears that at least one bank was rather amused by our observation. 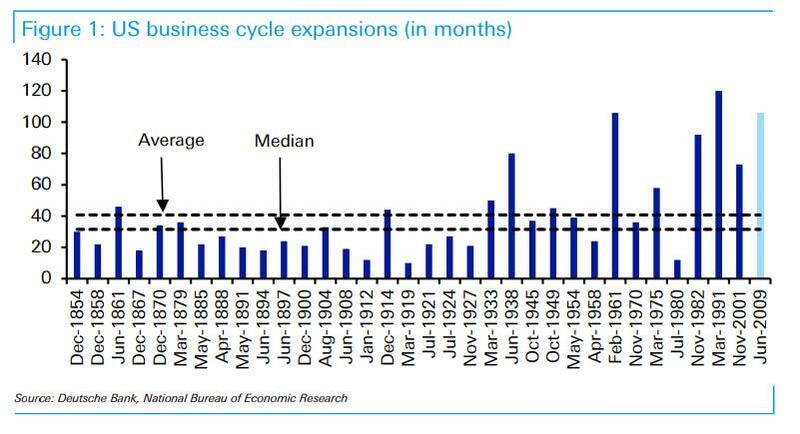 "when we read the latest Budget and Economic Outlook CBO report on Monday night we couldn’t help but highlight that the CBO is now estimating that there will be no recession within the next ten years (at least) - thus comfortably making this the longest economic cycle without contraction in US history...234 months and counting from June 30 2009 through December 31 2028." If correct, this would be around double the length of the 1991-2001 expansion - the current record holder. It seems infeasible to imagine such a scenario but with any long-term economic forecasts once you go beyond the next year or so there is often a convergence to the trend rate of growth so it’s understandable how they could come up with such analysis even if it is unlikely to be accurate. 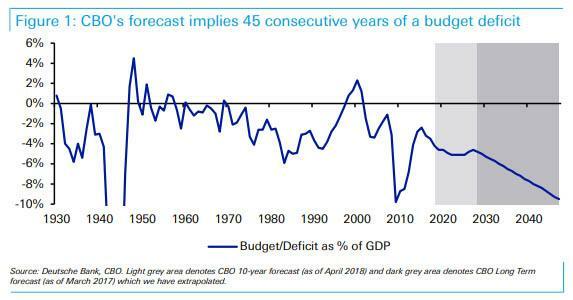 Quirky business cycle extrapolations aside, DB's Craig Nicol then notes that even more interesting in the numbers, was the trend implied by Figure 1, which suggests that the US will run an almost ever increasing budget deficit until at least 2047 - the end of their forecast period. And here is where the CBO's assumptions turns absolutely bizarre: such a stretch, DB calculates, would mean a run of at least 45 years of deficits when you stretch it back to the start of the run in 2002. It means that by 2047 we will have hit nearly 10% which is roughly equivalent to the 2009 GFC deficit. The only parallel period in terms of a consistently deteriorating budgetary position through time is that from 1948 to 1983 when a surplus of 4.5% turned into a deficit of 5.9%. Interestingly over that period, 10y Treasury yields rose over 960bps. But wait, it gets better, because in the CBO's "Baseline" forecast, i.e. 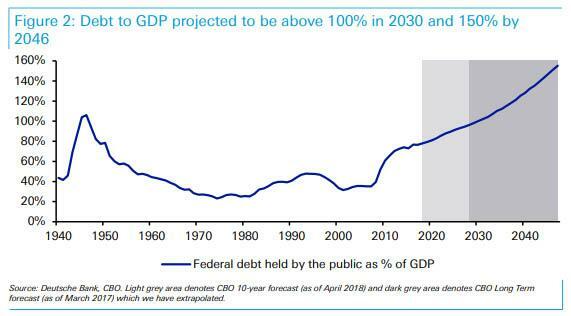 assuming everything turns out "as expected by the model creators", Federal Debt to GDP will breach 100% by 2030, and 150% by 2046. Putting this in context, since 1940 the "psychological" barrier of 100% debt/GDP has only ever breached 100% in 2 years and that was in the post-war spending related 1945-46 period. In other words, we may need a war distraction soon... Oh wait. 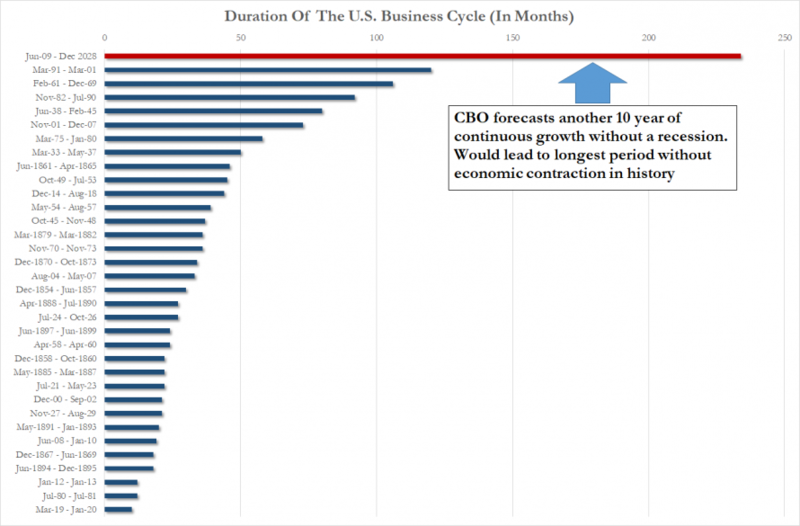 Just as concerning is that the CBO is not alone in this forecast of terminal unsustainability. 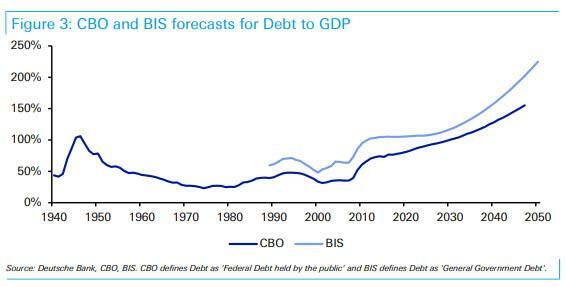 The next chart shows the BIS' forecasts alongside the CBO. They have a slightly different definition of Government debt but it is quite clear that the future profile is the same. So what do the chart above indicate? Stated simply, none of these forecasts will come true. As DB predicts, "when we look at all the graphs above, the overriding feeling is that there is little chance of these forecasts being correct purely on the basis that markets won’t allow it and the authorities will thus respond. Surely under this sort of debt profile, eventually bond yields will rise to prohibitive levels for activity and debt sustainability and either Governments will have to cut back spending dramatically or attempt to create inflation. Central banks may also have to help by printing more money again to buy/monetise the debt." In its conclusion, the German bank warns that while the CBO's forecasts "are a good guide to the direction of travel under current policy, growth and demographic trend assumptions" they "don’t look sustainable to us in a market framework" and adds that it will be hard to tolerate this surge in debt especially as other countries are also expected to see Government debt rise over this period according to authorities such as the BIS. So what happens when the market finally admits the future is unsustainable? In short, bad things, or as Duetsche Bank puts it politely, "a meaningful event." Hence we would expect market pressure to create a meaningful event to change this path over the years ahead.